The T2100 protects against partial or complete excitation loss on the synchronous generator. If a generator under parallel operation has a low excitation, a high inductive current is running into the generator. 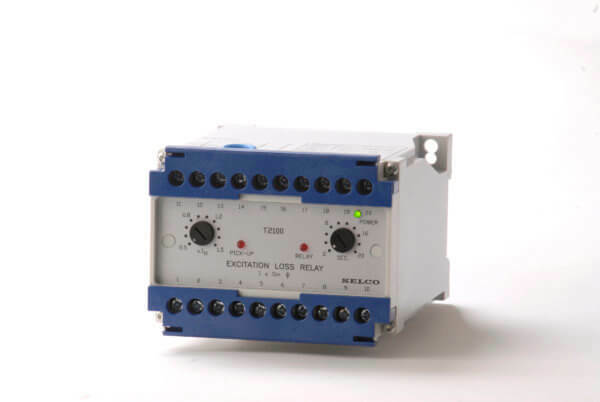 The T2100 Excitation Loss Relay protects against partial or complete excitation loss (field loss) on the synchronous generator. If the generator under parallel operation has a low excitation, a high inductive current is running into the generator. This current is detected and the breaker of the faulty generator is tripped, thus avoiding overload on the other generators with a possible black-out of the system. The T2100 measures the current through an external 5A CT attached on phase L1. The phase angle (phi) is determined from the voltage measurement across L1 and L2. The T2100 calculates the reactive current as I x sin phi. If the reactive current becomes negative and exceeds the preset level (0.5 – 1.4 x I), the pick-up LED will ignite and the trip delay timer (3 – 30 seconds) will activate. The built-in trip relay will energize after the delay has passed, provided that the preset trip level was continuously exceeded during the time of the delay.